Henna looks different on everyone. Body chemistry, temperature and location on the body have a lot to do with how dark the stain will be. Drier skin on the hands and feet stains much darker than the softer skin on the upper arm or back. 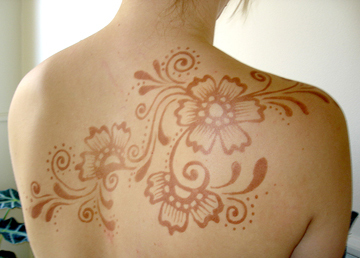 Henna stains are darkest during the first 7-10 days, then gradually fade. It is recommended to leave the paste on at least 5-6 hours or more. Leave paste on overnight for best results. The longer the paste stays on the skin, the darker the stain will be. The warmer the body temperature, the faster the henna will stain. If you are cold, try drinking something hot before you start. Gently steaming the area while the paste is on also helps. You can wrap the area with an elastic bandage, paper medical tape or toilet paper. Wrapping isn't required but it helps conserve heat and moisture, which help to make the stain darker. Also protects sheets if paste is left on overnight. I usually put a piece of toilet paper over the design, then wrap with an elastic bandage. If you want to use plastic wrap, be sure to wrap with toilet paper first to soak up any perspiration and to prevent smudges. DO NOT USE WATER!! You can use lemon juice or olive oil to remove the paste. You can also gently scrape the paste off or let it fall off naturally.Try not to get the area wet for at least 6-12 hours after paste removal although waiting a full 24 hours is best. The longer you prevent the area from getting wet with water, the better. Design will be bright orange at first and then gradually darken to brown. Henna stains take 48 hours to develop. Apply some kind of natural oil or butter after the paste is removed to protect henna design and prevent exfoliation. A lot of store bought moisturizers contain chemicals that can prematurely lighten the stain, so it's best to use something natural like Aveno moisturizer! Avoid moisturizers with fruit acids (Alpha-Hydroxy Acid) or bleaching agents. Exfoliation of the skin is what causes henna to fade. Excess washing and friction from clothing will make the stain fade faster. The less you touch the area, the better. Wear gloves when washing dishes if the design is on your hand. Leave paste on as long as possible. Visit Wikipedia to get more infromation about Henna.